It appears that the Hilary Duff/McCall relationship has ended--all trace of her has been wiped from the website and this doesn't appear even in the out of print section. It's a little too bad; while I don't have any feelings about Hilary Duff as a person or actress, the pattern line had some fun pieces in it. This is actually the second Hilary Duff pattern I've made, the first being my M5880 silk chiffon negligee dress. The tie neck blouse for the office has been back for some time so I decided to get in on the action. I made this around January, I think, out of some of the luscious silk/cotton I got in November from fabric.com. At $11/yd for this batch (with discount coupon) it is among some of the more expensive fabrics that I've purchased, but I didn't want it to get Too Good To Use--in this case, I would have to look for the Perfect Classic Pattern I Can Wear Forever--so I went ahead and cut into it for a trendy piece. Shocking. This is an easy pattern, just front, back, sleeves, tie, and bitty front facing--no closures. It's a bit of a fabric hog because the tie is cut on the bias. The slit that makes the neckline wide enough to pull over your neck is meant to be finished with a facing. While I normally try to engineer my way around using a facing, in this instance finishing that edge with bias tape would make it thicker and more unwieldy so I stuck with the facing. The pattern directs you to understitch that front facing, but in my experience with facings understitching is completely ineffective to keep them from flopping around. I absolutely did NOT want this facing flipping to the outside. I decided to topstitch it down, figuring that the tie would cover the topstitching anyway. In fact, the topstitching looks fine and it would be fine even if it showed. This is what the facing looks like from the inside. 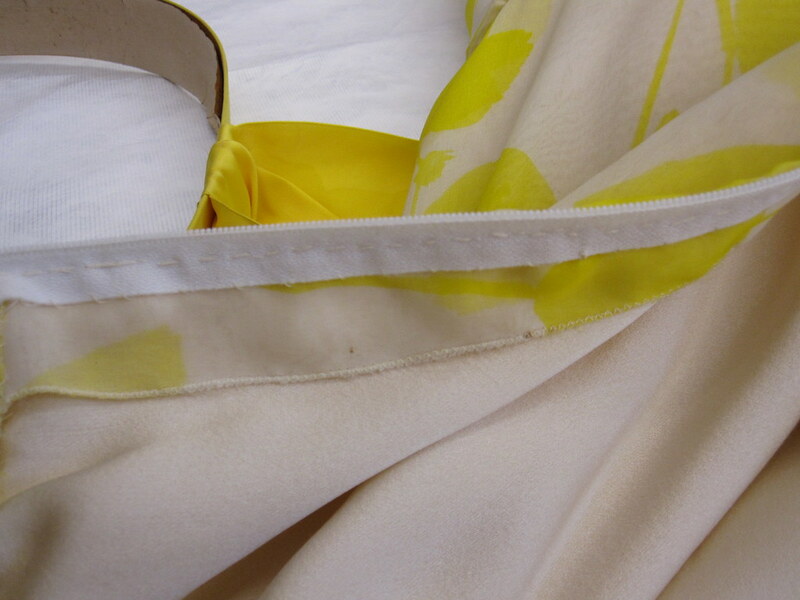 Because the fabric has silk content I sewed it in French seams. I still don't quite know how to handle an armscye in a French seam. 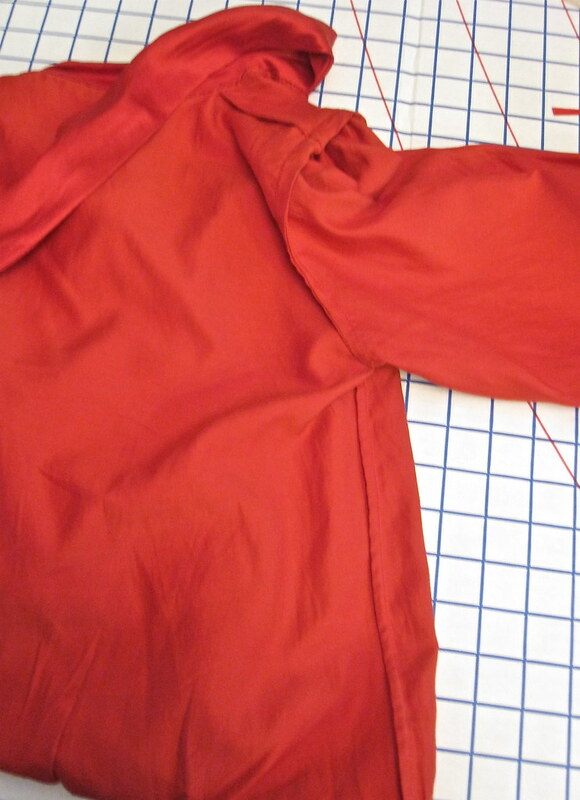 This time, I sewed the shoulder and side seams in French seams and then set in the sleeves with French seams. It worked pretty well. Except that the sleeves were just way, way, WAY too gathered and puffy. Anne Shirley would have loved them. I had lengthened the sleeve because I was thinking I might wear it as a 3/4 sleeve. In fact, it looks terrible with the sleeve going beyond my elbow, so it doesn't help that it's all pushed up either (I put elastic in the sleeveband). In the photos it's hard to tell a difference between the version at left (as drafted) and the finished version, but I cut about an inch and a half off the top of the sleeve cap after seeing the drafted version (which entailed undoing all those beautiful French seams). I might go back and shorten the sleeves eventually, which will help reduce the volume a little more, but I haven't bothered yet (and it's about to get retired for the season; too hot to wear that much silk!). In the end, I was surprised by how much I liked this top and how well it was drafted. I mean, there's not much to the drafting, but the facing in particular surprised me by being not horrible. 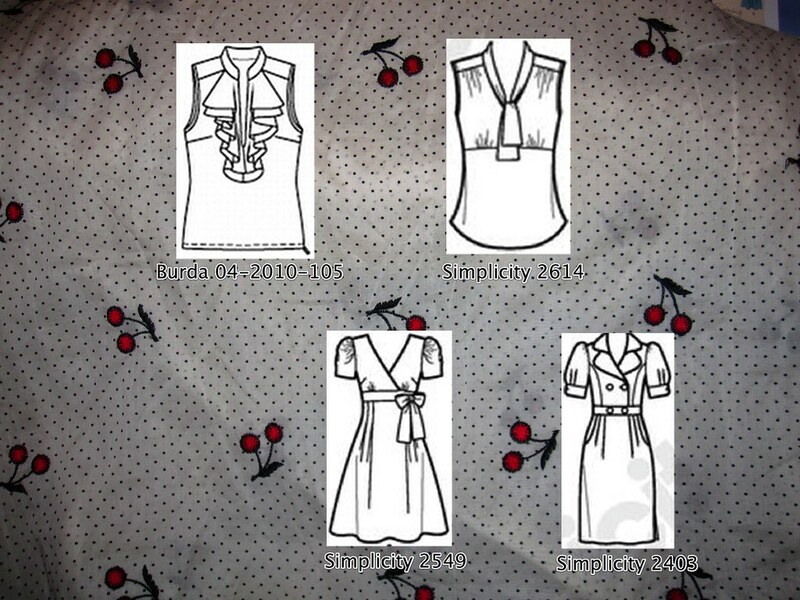 I actually like it better than the Burda 08-2008-119 tie neck top and may try it sleeveless this summer, maybe even out of that same silk chiffon as the earlier Hilary Duff pattern, just to be strange. In case you're curious, the skirt is a Knip Mode from last year. While on Day 1 of PR Weekend Philly 2010 we were all very civilized and cultured and educated (I went back and added a photo of my embellishment sample), on Day 2 it was time for some shameless commerce. 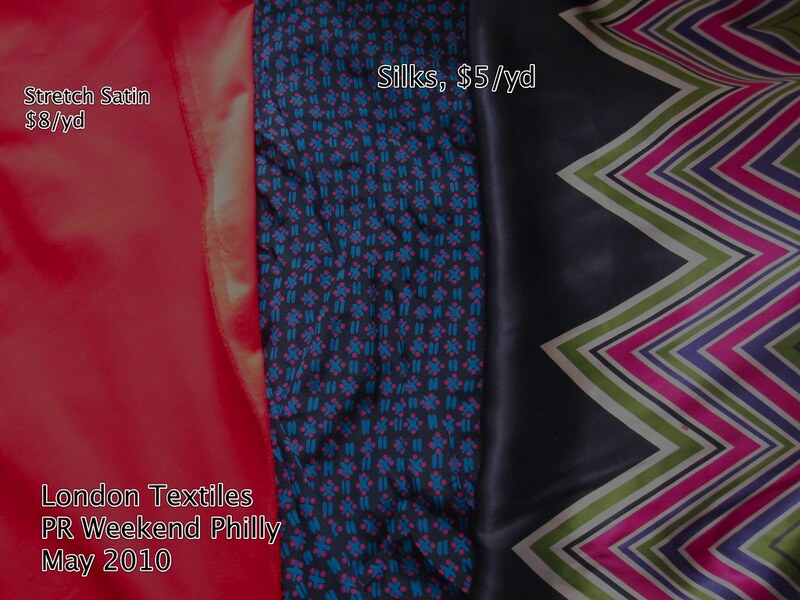 Our first stop was Philadelphia's Fabric Row. I knew I had a long day of impulse purchases ahead of me, so rather than fabric shop I hit up a flea market at a little park down 4th St where I picked up several brooches. I have complained about DC thrift shopping before, and I will note again that there is NOTHING by way of jewelry at any of the thrifts in this area. I have developed a love for funky brooches and was so happy to find some. London Textiles! This warehouse is usually wholesale only, but they opened up the store special just for us. There were huge shelves with rolls of fabric by the bolt, but the prices were about the same as or higher than at any bricks and mortar store, and higher than online prices. The real bargains were the remnants: silk and wool were $5/yd, everything else $3/yd, the only catch being that you had to buy the whole piece. This is the kind of store where you really do want to shop with fifty of your closest friends. 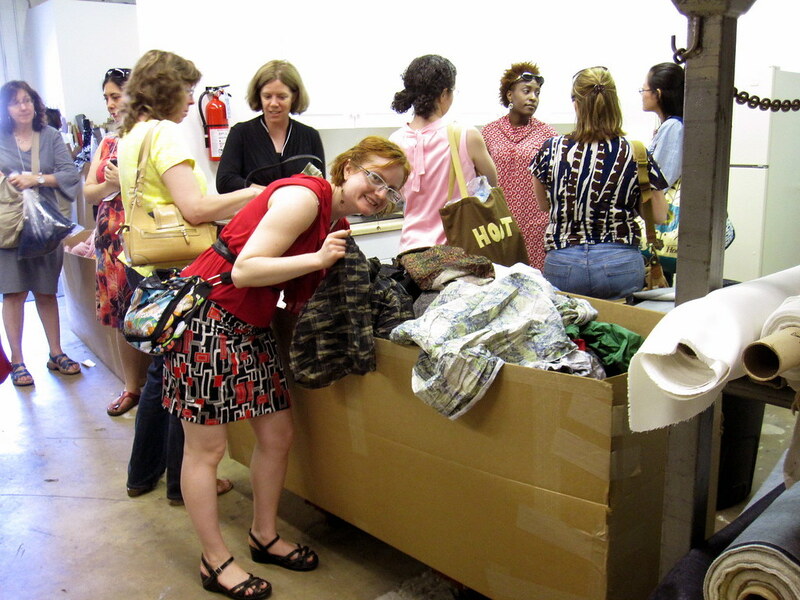 When we first arrived, I kind of picked through a couple of the bins but didn't find anything interesting and was totally not enthused. I wandered the bolts for a bit and when I came back people were working the remnant bins and the churning turned up lots of great pieces, none of which I had spotted on my own. I eventually ended up with a huge armload and had to make myself breathe for a minute and pare down. We really cleaned them out! The picture on the right was taken after the line died down. You can imagine what it was like before! Observe all the stacked up rolls of cut fabric on the right and then imagine that we probably bought at least four times as many remnants as bolt fabrics. I'm surprised the bus managed to chug its way back across the river...and this was before we decimated Jomar! As you can see, I did pretty well for myself. All this for around $60!!!! I'll talk about my ideas for several of the fabrics in more detail below. 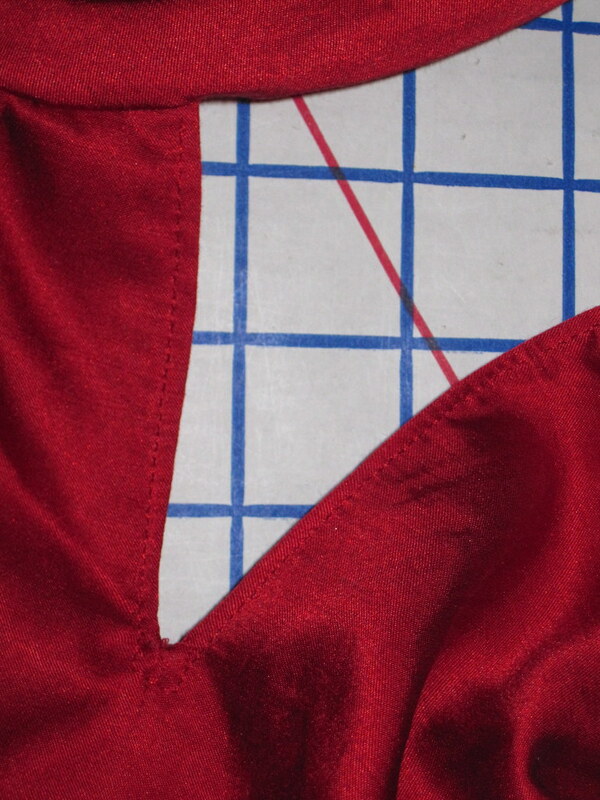 The red stretch satin will be for a skirt, using the matte side. I bought some red stretch twill from Kashi in NYC and have made it into a skirt, but it was not an entirely successful project (I chose a style I knew probably wouldn't work for me and it didn't; will review it eventually) so one of my actual shopping goals for the weekend was a red to replace that. 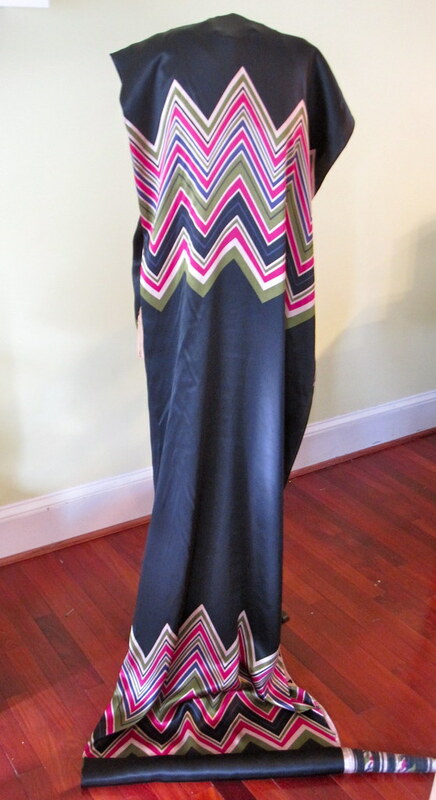 The silk on the right with the zigzag print was my indulgence purchase. It is four yards of silk charmeuse. The print is huge and there are about 30 inches of black in between each iteration of the print, so placement will be, well, a huge pain in the @ss. I have it draped over my dressform (which is taller than me) to give you an idea of scale. I have no idea what I'll do with it or when I will do anything with it, but it is all my favorite colors and is a really luscious charmeuse and I will enjoy having it in stash to play with and pet. What looks like a black and white floral is actually--I think--a navy floral. It looked navy in the warehouse, but black in the hotel room. In strong sunlight in my bedroom it is navy, but under artificial lighting it is black. I wanted it for a skirt to go with red tops, but I find black/white with red not as interesting as navy with red and now I'm waffling. It's only a smidge over a yard so a skirt is probably all I can do with it anyway. Sadly, a pre-wash did not fade the navy bits as I'd hoped. We bribed the bus driver with a little extra cash to make sure we all had time finish our shopping and headed back to the hotel. I think I was carrying my weight in fabric in two HUGE bags, each larger than my suitcase. I was a little concerned. However, I spent some time rolling all the fabric neatly and got it packed away no problem. At this point I was exhausted. I will steal a line from LindsayT and note that I am probably more of an introvert than people expected. I love meeting and talking to new people--especially about sewing--but there is a limit to how long I can be extroverted. It takes a lot out of me and between the sleep deprivation and all the excitement my batteries were dead. So I apologize if I ever seemed aloof! It was definitely not personal, and I was really thrilled to meet everyone. I just had some pizza for dinner and crashed out as soon as I could. And now, for some fantasy sewing. I don't know when, exactly, I think I will get to all this sewing, but that's why it's a fantasy. For some reason, I don't actually love this print. It is many of my favorite things--silk, turquoise, hot pink--but something about the scale of it doesn't thrill me. However, since it is all the colors I love (and therefore will go with much of my wardrobe) and it was $5 I picked it up (I found it on Vogue Fabrics for $14.99/yd!). The selvage says Anna Sui (c)2006. I think she must overbuy by a lot as a habit--it seems all the jobbers and mill end stores always have a ton of her stuff! I think I found this print in her Fall 2007 show, as the lower hem/underskirt of the look at right. I am runway, baby! I will make it into another Simplicity 2938 tank, cut a size larger than last time as this doesn't have any stretch like my Vietnamese silk one (I've already altered the pattern for a broader broad back adjustment). I considered maybe trying to squeeze out the Burda 08-2009-117 flounce blouse as I want to try the sleeveless version after making the one with sleeves, but I can wear a sleeveless silk tank/shell in a subdued print forever; a giant flounce has a limited shelf life. LOVE this green suiting. It is a stretch with giant houndsteeth in one of my favorite colors and it will be a shift dress I can wear with a jacket for a professional look. But I am a little stumped as to what pattern to use. 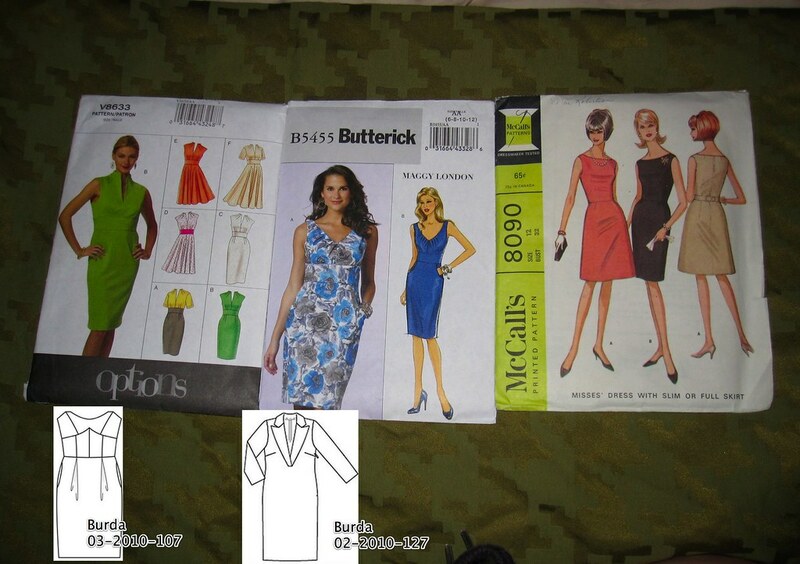 The two patterns on the left, Vogue 8633 and Butterick 5455 are the two sheath patterns I am obsessed with right now. But I don't think either is quite right. I think it needs to be simple and truly sleeveless, which cuts out V8633. But I think the fabric is too thick for B5455's neck pleats (and when I realized the B5455 midriff is only in the front I fell out of love a little bit). The vintage pattern on the right is a simple, classic sheath with an interesting French dart, but would require muslining and grading and a whole bunch of work and then it would be...the plainest, simplest sheath dress ever (you say classic, I say boring--tomato, tomahto). It would, however, allow the fabric to be the star, and the huge weave/print means it needs to be cut into as few pieces as possible. And then I am a little obsessed with two projects Cidell has posted recently, the Burda 03-2010-107 strapless brocade dress and the Burda 02-2010-127 deep V neck notch collar sheath. But, I could never, ever wear a strapless dress to work, no matter how much I told myself the jacket makes it professional and you couldn't wear a jacket over the notch-collar sheath because that would be way too much collar going on (and I don't think it would work sleeveless, although feel free to convince me otherwise). Oh and by the way, don't I already have a shift in this exact color? Why yes, I do. And two skirts. And a cocktail dress. I have finally broken myself of buying the same shoe over and over, now I just need to work on fabric! The black and white knit print will be a cowl top, either my tried and true Simplicity 9626 (now out of print), or Simplicity 2580, which Melissa demonstrated makes a fab top. I am torn here. On the one hand I am not feeling the empire seam on tops lately, as I feel they cannot be tucked because it divides the top into weird thirds. On the other hand, I am the opposite of Carolyn--why sew a pattern you've already done when there can be something Shiny!New! to mystify or amaze you. And now I'm toying with the idea of Simplicity 2554 View C (with a narrower hip band). I have a scant yard of this so it may come down to which pattern actually fits the fabric. Carolyn and Meg were both into the black border on this one, but I am not drawn to it. What say ye of a black band at the hip? Slimming or widening? Interesting or jarring? This adorable embroidered cherry fabric was a giant remnant, larger than I needed at around 4 yards. Someone in line offered to split it with me, but we both kind of wanted 2.5 yards. The cutting lady said she'd cut some off the bolt (conveniently already at the table) for me at the remnant price. She found a marriage in the fabric and threw in that part for free (a little under a yard), and I ended up with nearly four yards after all. So I can probably get a top and a dress out of this one. For the dress, I am leaning toward Simplicity 2403. I love the double breasted view with the rounded notched collar, and the light voile weight and texture of this fabric would look great in that collar. However, I'm not sure the lightweight fabric will work so well as the skirt, so I'd have to do a black skirt. But I would (theoretically) already have a top that would have to be worn with either a red or a black skirt, and the outfits wouldn't be different enough to satisfy me. Maybe the skirt could be made of the same fabric? It will definitely be lined. 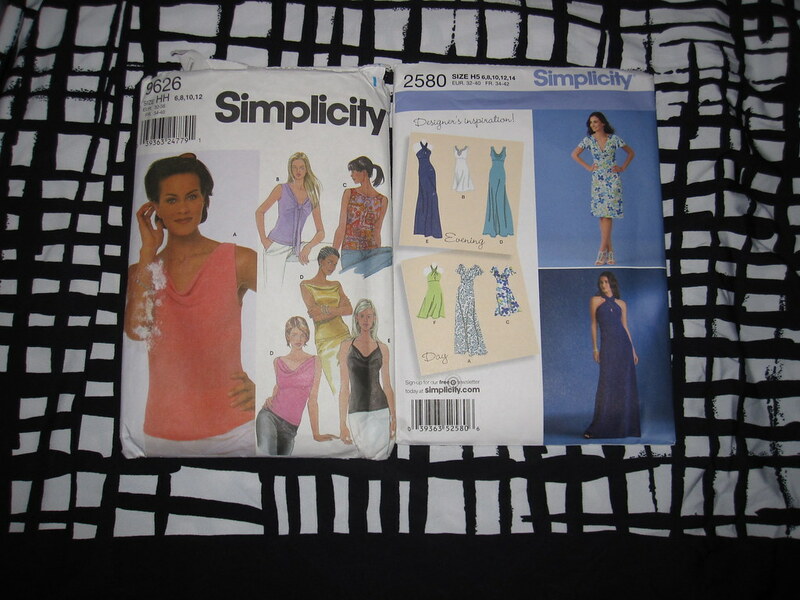 I am also considering Simplicity 2549 view A. It's a little vintagey and fun with that full skirt and puffed sleeve. But it would be a little cliche with that fabric, I think. Cherries are very retro hipster pin-up and while there's nothing wrong with that I don't want to be stereotypical retro hipster pin-up. I don't have the bangs, for one thing. I was picturing a shirtdress with a peter pan collar but (yet again) I already have almost that identical item in my closet of a red swiss dot, my Philosophy Patrones dress. For the blouses, I am pretty much set on Simplicity 2614, the Threads tie neck blouse. I do want to try out Burda 04-2010-105 soon (my subscription to Burda runs from July-June and the most recent issue I have sewn from is August 2009--so I have made virtually NOTHING from this entire year's subscription), but I don't think this is it. Finally, we come to this double sided crinkle acetate. It is actually two layers of fabric fused together, rather than a print made of the weave. I was kind of picturing a shawl collar wrap dress with the collar and the tie made of the dark reverse side of the fabric. 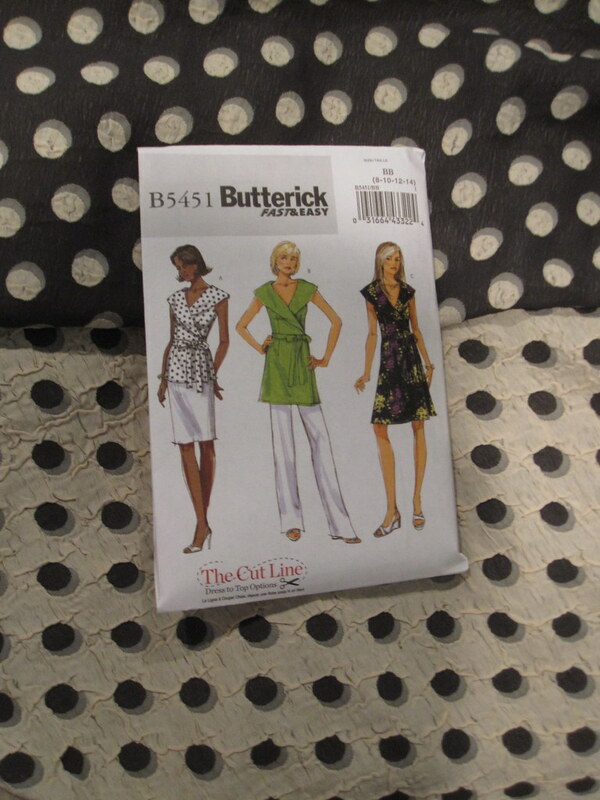 I went into my pattern stash and lo and behold found Butterick 5451. The problem is, nobody has made this dress on PatternReview! I want someone else to go through the work of testing this out for me. Heh. I may just go for it (when? who knows); I can scale back the collar in process by taking a deeper seam allowance at the outer collar edge if it's outrageous. I also kind of picture this with a 3/4 sleeve as Fall/Winter dress, so I'd have to add a sleeve. But I don't know if there's enough fabric for that. Well, this is an incredibly long post. I think I might have a 12 Step level problem with fabric buying, but I enjoy it so and love having a stash of beautiful fabrics that call to me! And I really do have such a stash. I am very lucky. We'll see which one of these calls to me first (well, I already know it will be the red skirt--the serger is already threaded in red, but that doesn't really count as a calling). All photos from the weekend are here. PR Weekend Philadelphia was so fun! There were around 50 participants--I got to meet so many people I have "known" online for years. We totally lucked out and had beautiful weather all weekend. The hotel was perfectly situated in a very walkable part of town with lots of trees and green space. And thanks to the hard work of the planning committee headed by Karen and ably assisted by Elaray, Andrea, and others who I know I am accidentally leaving off, everything went perfectly! All the transportation, meals, and events came off without a hitch. Having planned large events for work before, I know that is a feat! After staying up waaaaay too late finishing up a new outfit and packing I left the house at 5:30 am to take the bus to Union Station and catch the Amtrak to Philadelphia's 30th Street Station. I am not a morning person; I only undertook this insane mission because Kenneth King's class started at 8:30 in the morning. I have never actually taken a sewing class, really. Even though this wasn't really sewing but embellishing, I thought it would be interesting to see what it's like in a sewing classroom! Lisette and I coordinated to be on the same train car (the Quiet Car, best invention ever) and shared a cab over to the hotel and got there in time to check in and find places before the class started. 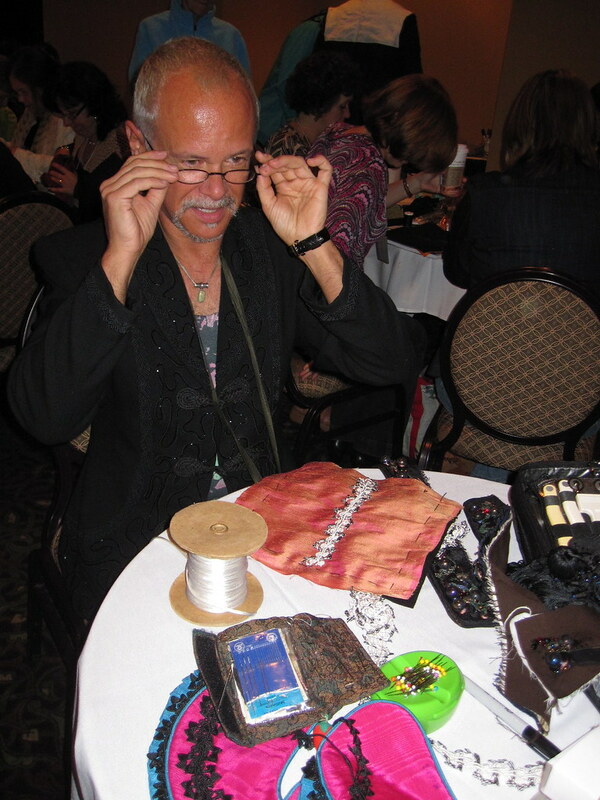 Kenneth King started off by showing us some pieces in which he had incorporated embroidery, beading, and other embellishments as examples of what we could do with those techniques. They were certainly over the top! Then he started the lesson, with plenty of anecdotes woven in to keep us amused. Although I grumble about it in anticipation, I always forget how much I actually enjoy doing hand sewing. It takes me back to when I first started sewing as a little kid. I sewed by hand for *years*--from about age 6 to age 12--and loved it. The technique he demonstrated was an interesting way to use larger trims and rattail braid. Embellishment is not my thing, but it could create a nice look for the cuffs and collar of a winter coat. After lunch in small groups, our next stop was the Philadelphia Museum of Art. We picked up the cute little trolley bus and rode through town to the Perelman building to see the Inspiring Fashion exhibition and visit the textile study room. The exhibition is a display of 17 contemporary pieces from big designers. I just loooove getting to see these clothes in person--and the only place I will ever see them in person is at a museum! There were lots of great designs by people I love, like Carolina Herrera and Diane von Furstenburg. The dress at left is by Zac Posen. Then it was our turn in the study room! We did it in three different groups to make sure everyone would be able to get a good view. This was really an amazing opportunity. While seeing fashion in a museum is so much better than just looking at pictures, you only get one view and generally the item is dressed on a mannequin. In the study room, the staff showed us every angle of each piece--including the inside so we could analyze the construction. 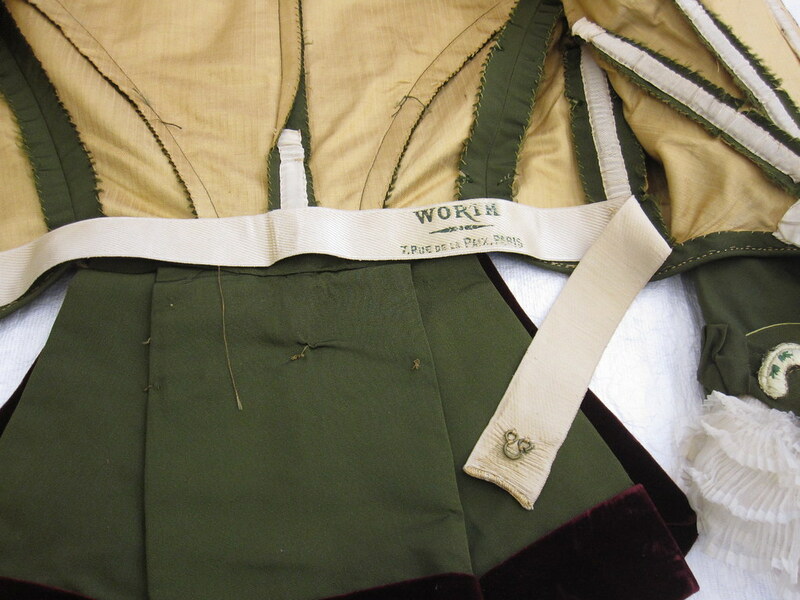 We started with this beautiful ensemble from the 19th century, created by the house of Worth. The colors are still so vivid! The staff member doing the demonstration said that several pieces, including this one, had been found in a trunk in a home in Philadelphia and the owners donated the contents. I don't know that I could have been so unselfish! We were all intrigued by the waist stay, and the short pieces of boning in the jacket (the bodice had full length boning). On to more contemporary couture, we just loved getting a glimpse of how it is put together in the ateliers. The closure at left is for the underdress of this lacy confection. I would have guessed early 80s for the date of the dress based on the style; it is in fact from the 50s. When I first glanced at the closure I just saw the hooks. 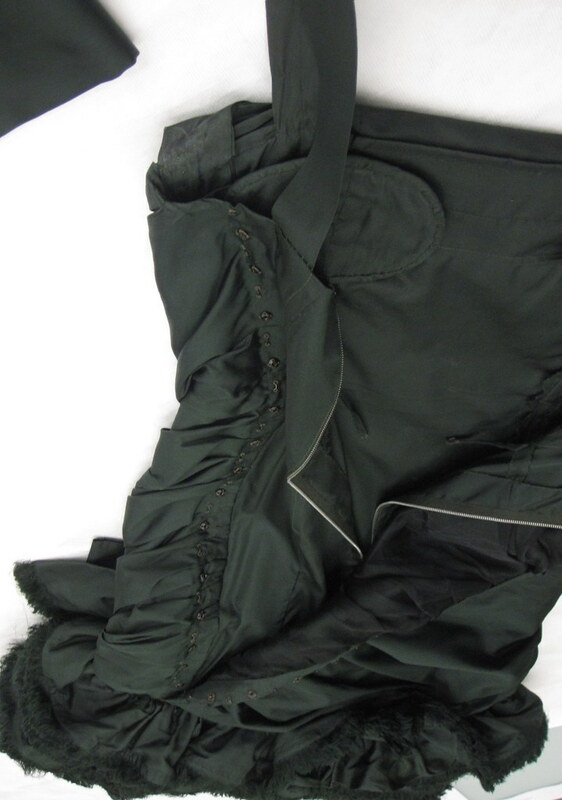 But take another look--it is alternating hooks and snaps, in addition to the zipper. I am guessing if you can afford couture, you can afford someone to spend 45 minutes getting you in and out of your dress! It is so interesting that a dress that appears to be somewhat simple and shapeless is so complicated on the inside! Contrast the fussiness of the closure with the inside view of a hand-picked zipper on the right. Although the stitches on the outside of the zipper are very tiny and precise, inside it doesn't look much different than when I baste a zipper. I had a lovely walk back to the hotel and rested up for a few minutes before we headed to our group dinner at Pietro's for some delicious family-style Italian food. The only bad weather we had all weekend came while we were enjoying our meal--it poured!!!! Luckily, we could stay in the banquet room while the weather stormed and it gave us a chance to do a fashion show! Seeing each others' custom clothing was just as fun as seeing the museum's collection, and plus we were allowed to touch. Two of my favorites were AuntieAllyn's Vogue 8659 artsy, striking tunic and Audrey's carrot pants from Burda 08-2009-123. I don't think it's a coincidence that both the models were very tall and as a petite I could never wear either of these items, only be amazed at how good they can look on someone else! I also loved seeing Mrs. Bewley's Kwik Sew 3740 cowl top in person; I am going to have to break down and buy this pattern. At this point we were beyond exhausted and headed straight to bed. We had to have all our strength for Saturday's shopping excursion. All photos are here. Day Two is coming soon! Spring Mini Wardrobe, Blog Housekeeping, Hairdos, & Philly! Just for my own amusement I had to make up a storyboard for my Spring mini wardrobe! 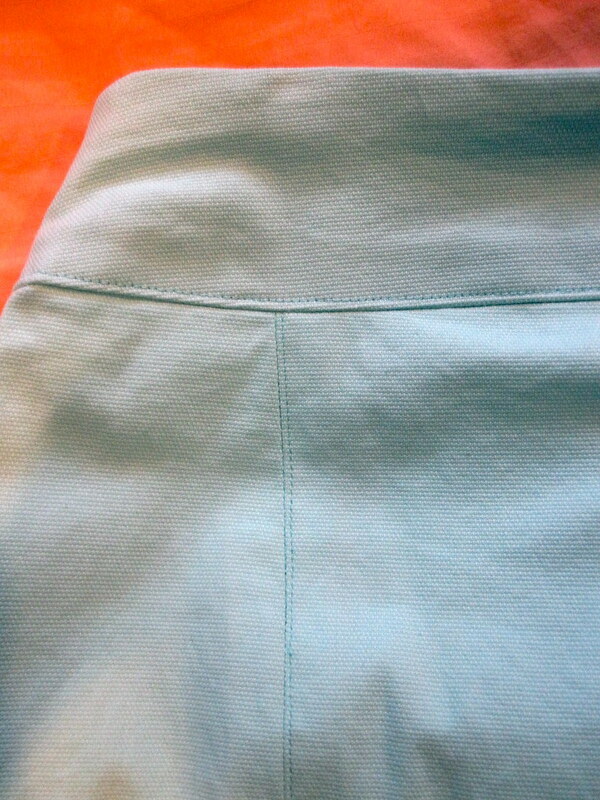 (Although Anonymous kindly asked to see the Simplicity 2938 tank with the aqua Alexis skirt--voila!) 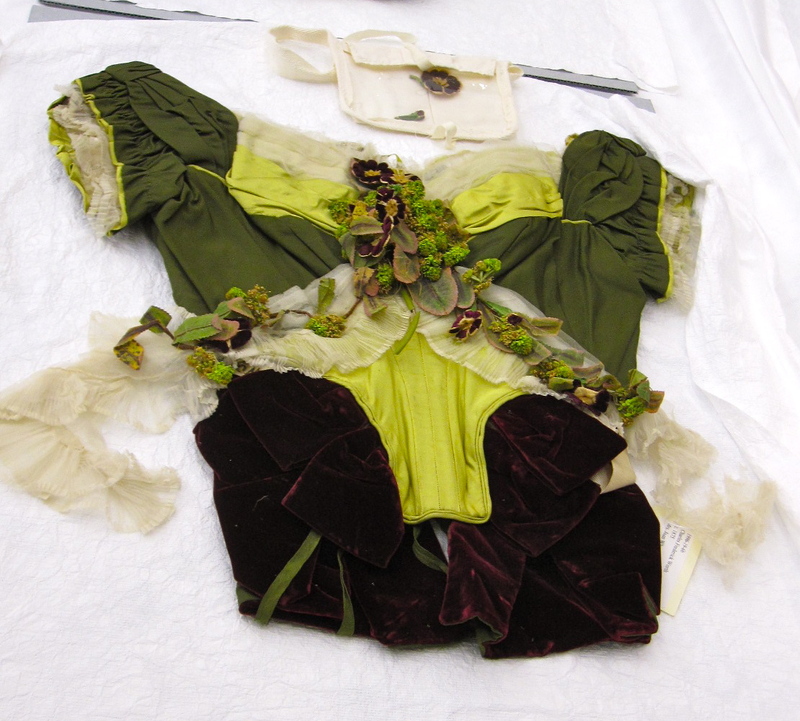 The name "Silk Spins Into Spring" arose when I realized that three of the four garments are silk; the silk garments all come from stash, too--up to 4 years old! 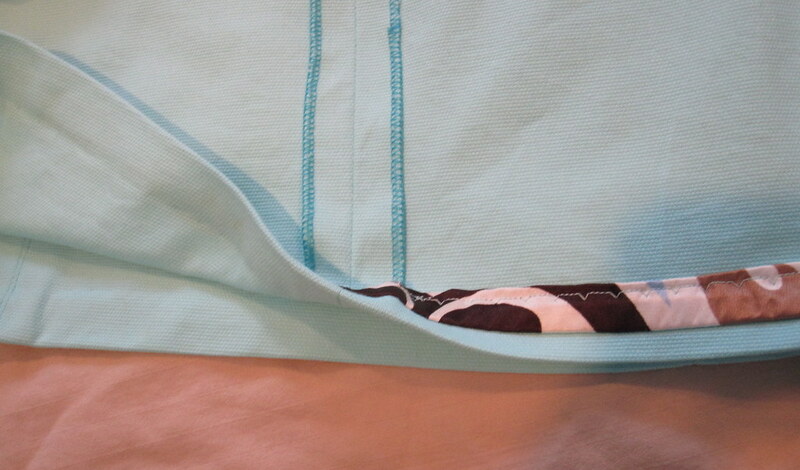 I had everything done but the lining for the aqua skirt before the PR contest deadline, but alas the lining did not arrive until a few days later. I would just like it to be known that I am actually capable of following through on a plan *and* making separates *and* making coordinated looks. This actually worked out really well for me. It was very motivating and I have since been on an "endless combinations" kick of making work tops and skirts, each one matching the one before, with only a few (ahem) deviations. The photo shoot for all the combinations is here. A few of you have noticed that I got my Spring haircut! I first got this cut two years ago, after Single White Female-ing a co-worker into telling me who her hairdresser is (Claire Burnham, who is fantastic and worth every penny) and asking for the exact same cut as my co-worker. Luckily, she wears her hair straight, so we don't look matchy matchy together. I experimented with pin curls and eventually realized that hanging my head upside down for five minutes with mousse, a diffuser, and 80s style "sprunching" (bunching and scrunching and mooshing my hair) I could sort of approximate curls. I think the best it has ever looked was for my Simplicity 3503 photo shoot at left. Mostly it is kind of a Monet, to quote Clueless--it looks curly from a distance but don't look too closely! I love it, even if it involves actual work. I let it grow longer in winter due to wearing hats for warmth; the "curls" will not stand up to a strong wind, much less a hat. When my hair is longer my "style" is to comb it while wet and that's it. I like the little flip it does, but that is totally coincidental and au naturel. I finally got around to doing some blog housekeeping. It should not affect subscriptions or reading in any way and the blog address has not changed. The first blog I started was a travel blog, and I registered my primary email address (gmail) for my username Gretchen the Household Deity (she was a gift that could not have been less to my taste but I could not get rid of, so I had to find some way to make her at all relevant to my life). 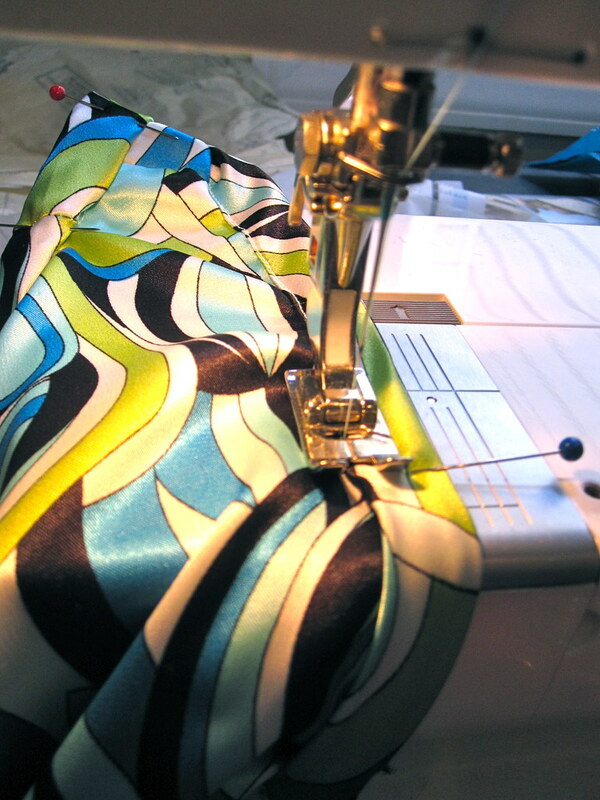 When I started my sewing blog I had to use my non-primary email address (hotmail) as my user name. It turns out I do a lot more sewing blogging than travel blogging! Well, Google is all-seeing, and when I log into blogger it automatically logs me in with my gmail address so I always had to then log out, log back in with my hotmail address, this would kick me out of gmail, and then I'd have to log back in to gmail, and I had to remember to do this every time I restarted my browser and obviously I didn't always remember. It took about 40 minutes and logging in to each account approximately a dozen times but I have now switched which username is registered to which email address. Blah blah blah, this is not interesting to anyone but me. The only relevant thing for you is that now all my old posts are listed under "Gretchen the Household Deity" (except a few I had accidentally originally posted under that name) and going forward all posts will be under The Slapdash Sewist. Don't be alarmed--I have not been hacked and both usernames are actually me. Who else is excited for PR Weekend Philly????? I am guessing everyone else is just as excited as me, but just like me too busy frantically trying to finish a new outfit to answer! I've done plenty of sewing lately, but all my projects are work clothes that won't travel well so I'm trying to finish up a new outfit of travel friendly knits. Now I just have to figure out how much fabric I can buy without endangering the structural integrity of my house... 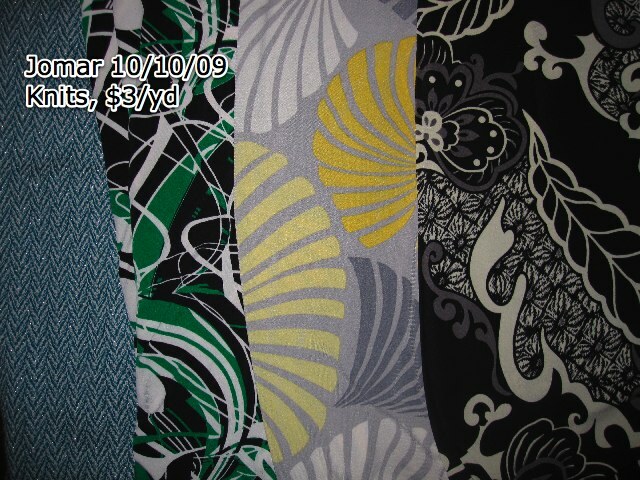 These fabrics are my last haul from Jomar (only one of them still in stash! not bad!!! 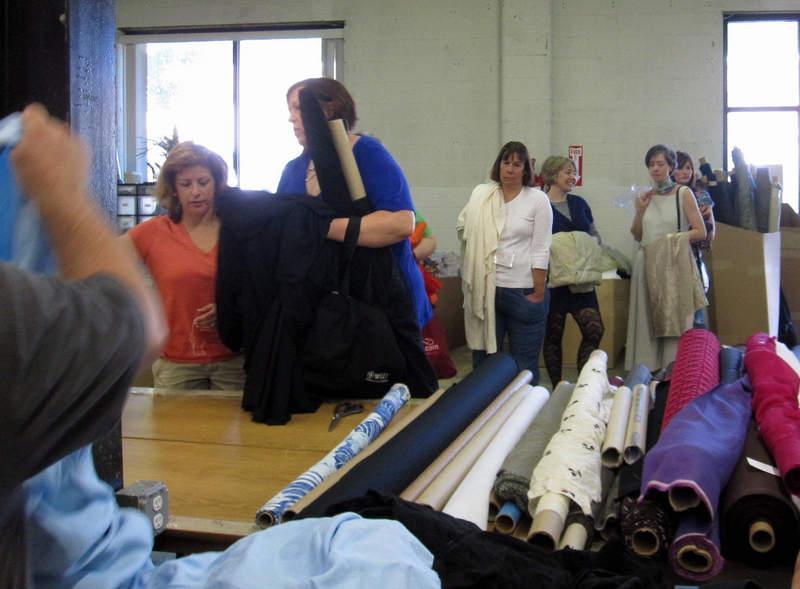 ), and that's not even taking into account the warehouse we're visiting in New Jersey. 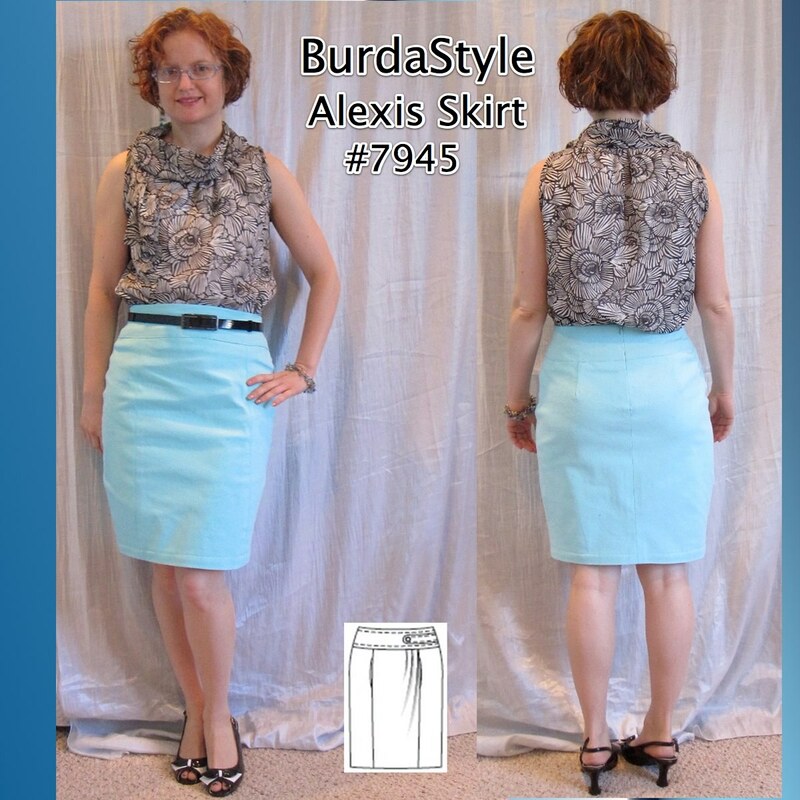 Here is another solid-colored pencil skirt for Spring, BurdaStyle Alexis. 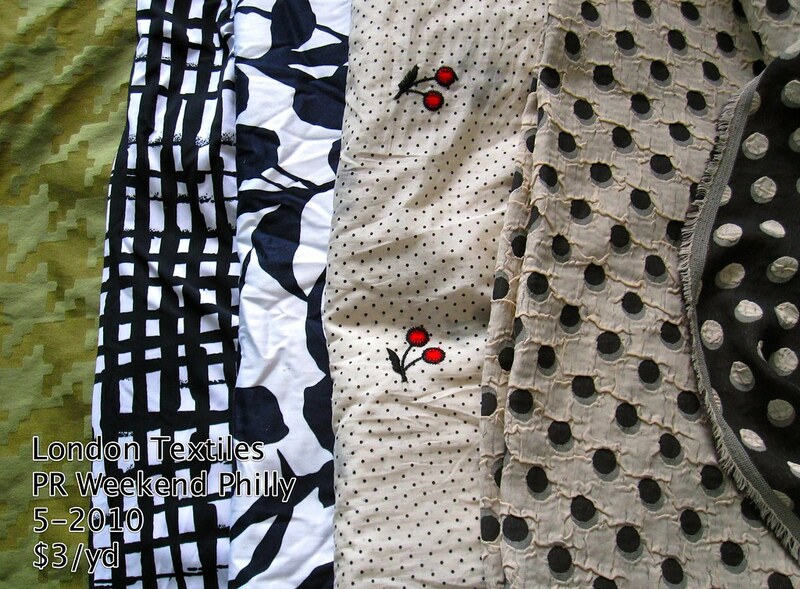 This is one of the skirt fabrics I got from Kashi when I went to NYC in March. I was *so* happy to find them as they were exactly what I was looking for--cotton twill with lycra, but unfortunately they wrinkled horribly after washing and hanging dry (I never put anything with lycra in the dryer). So I don't know how well they will actually wear. We've been having a weird cold snap and I haven't had the chance to try this skirt out yet. I really like the idea of the Alexis skirt as drafted, with those asymmetric pleats in the center front panel. It is also designed with a kanagaroo pocket on the center front panel, but based on most of the photos I've seen of finished versions, the pocket seemed to make the front pop open. The last thing I want to do is add more volume to my belly! On PatternReview, elily00 left off the pocket and it appeared that this mitigated the problem with the pleats popping open. So I made it with the pleats, sewing the center front/side front seam instead of inserting a pocket. Well, yuck. 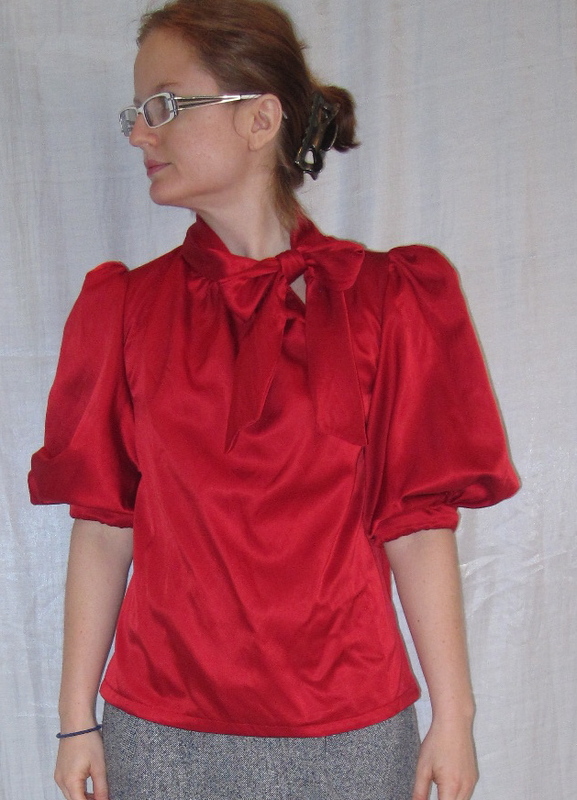 The photo is really not conveying how bad the popped open pleats look, but they were awful. It looked like a had a growth on my thigh, and the pleats expanded and expanded like an accordion as I walked. Since there was no chance I would ever wear the skirt as made, I decided to take out the pleats. I went back and looked at the center front panel pattern piece, and the volume for the pleats were formed by drawing a diagonal line out from the hem to the top, completely symmetrical (this may be part of the problem). I unstitched the center front panel from the side front along the pleat side and just cut out that diagonal wedge and put it back together. The center front of the CF panel is marked, so in the future I'll just put that on the fold. It was a straight skirt in that iteration; I pegged the side seams two inches (one inch each from front and back) to give it a pencil line. It is now a very basic skirt, but actually wearable. So I'll take basic! It has nice lines with the front princess seams and the wide contoured waistband. To emphasize those lines, I topstitched the lower waistband seam and the front princess seams in a slightly darker thread color. The effect is extremely subtle, but I think adds a nice little touch. This was the last piece of my Spring Mini Wardrobe, and I actually had the skirt done the day before the end of the contest, but my lining had not yet arrived. 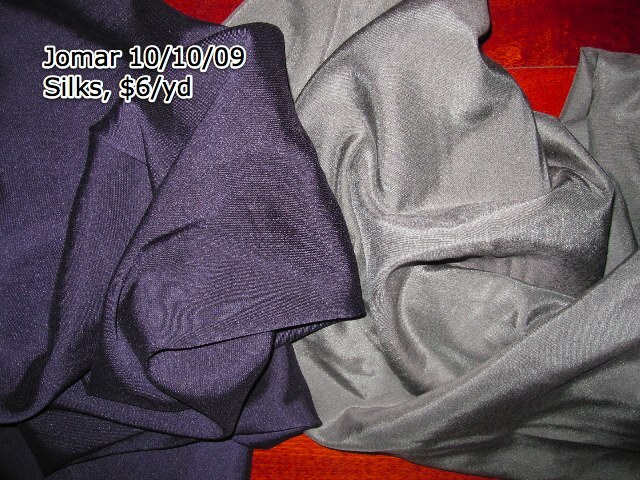 I ordered this stretch polyester from Fashion Fabrics Club. 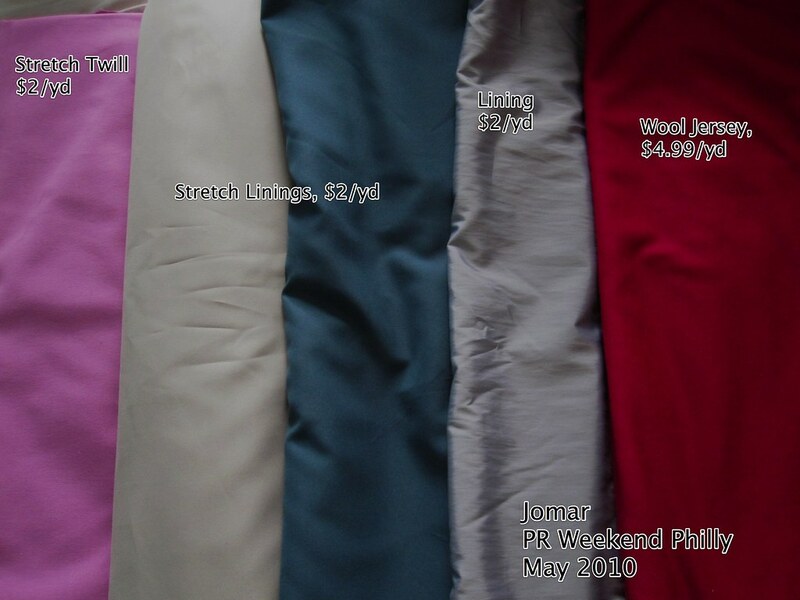 In the same order, I had six yards of "stretch" lining that actually had no stretch; I sent it back to FFC over two weeks ago (after corresponding with them to let them know I was dissatisfied and sending it back), with tracking and I know they got it within a few days, and have heard NOTHING from them, despite sending several emails. Has anyone ever had to get a refund from them? Any ideas? Anyway, I like this lining. It's a fun print, very slippery, and very stretchy. I had cut off some hem length during the process of sewing this skirt, but then realized I cut off too much. Oops. I wasn't able to do a double-turned hem, so I made a hem band out of the lining fabric (along the crossgrain to have stretch) and used that to make a machine blind hem. I actually started out by doing a hand hem, but even when I took up only a thread or two of the fashion fabric my hand hem showed on the outside. After the trials and tribulations of putting this together, I am very happy with the final result. The fabric has a bit of a pique texture, and I LOVE the color. As I said, I'm not sure how well it will hold up to wearing as it got SO wrinkled after washing, but if it is wearable I have a feeling it will be a favorite skirt for this season! This wardrobe pattern has been getting a lot of love on Pattern Review, mostly for the tank, so last time Simplicity was on sale and I was able to get to Joann I picked up Simplicity 2938 so I could give it a try. I used one of the stretch silk charmeuse fabrics I got in Vietnam at the Ben Thanh Market in Ho Chi Minh City, so it was a great Special Fabric and Stashbusting (as I bought this fabric in 2008) project. When I posted my fail of a wrap blouse, Vogue 7876 that was so tight across the back under the arms I solicited advice about how to deal with this recurring problem. I spend a lot of time at the gym, and that band of muscles (trapezoids, deltoids, latissimus) are well-developed from lifting heavy weights. 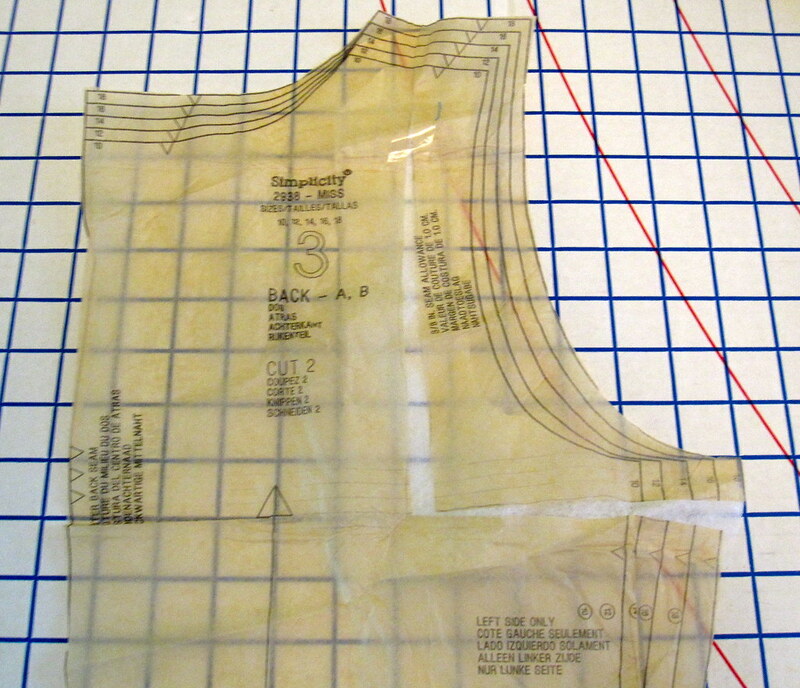 Searching for a solution had yielded several tutorials, like this one from Threads, that tell you to split the pattern in a straight line all the way from shoulder to hem and add width to the entire pattern. 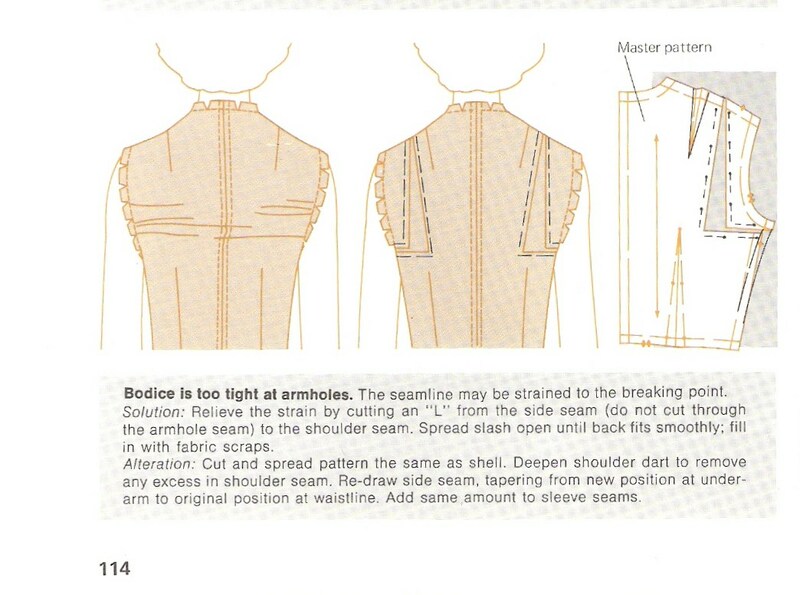 This does not make any sense for me, as I have narrower-than-average shoulders *and* a swayback, and adding extra fabric in both of those places would create way more problems than it would solve. Then Rachel kindly posted for me the scan at the left, which made so much sense! 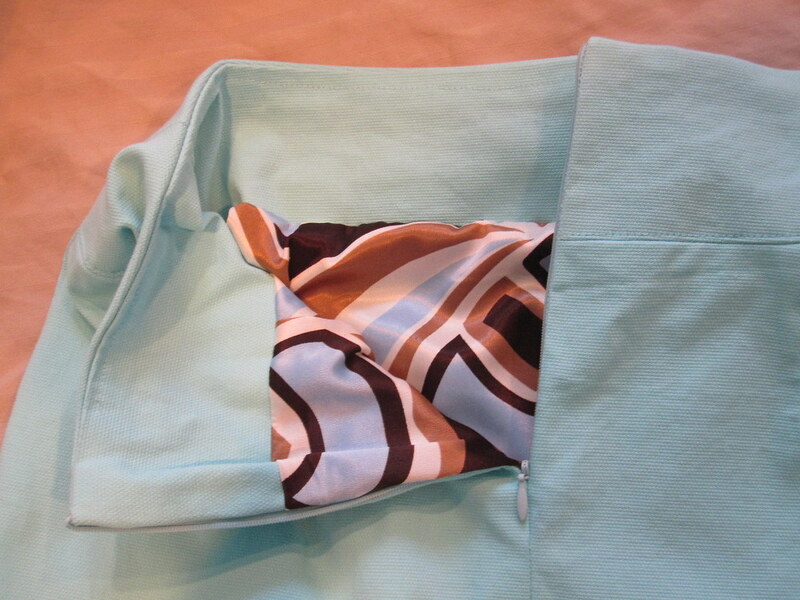 It gives me more room exactly where I need it, without adding more fabric where I don't. So, based on the information Rachel supplied, I did my first broad back adjustment! I didn't know if I'd really need it, given the ease on this top and the fact that I haven't had much trouble with Simplicity's backs, but I wanted to break the seal. This top fits well, but I think the little bit of stretch in the fabric is necessary and I could actually use even more of an adjustment. How exciting to finally know how to deal with this problem!!!! There is a misprint on the pattern tissue for the finished garment measurements--they switched the waist and hip finished measurements. I'm glad I took the time to puzzle this out. I looked at the finished hip measurement and saw the size 18 with a 41" finished hip measurement would probably be best. Although I do have large hips relative to the rest of my body, 18 is still a lot, especially as I was cutting a 10 at the bust and normally cut a 14 at the hip. But then I saw it said 8 1/2" of ease over body measurement. I grabbed the envelope and looked up the hip measurement for an 18--42 inches, so plus the 8 1/2 inches of ease it should have been 50 1/2 inches, not 41 inches. Math was not my best subject but something was not adding up here! So in fact, once you switch out the numbers, the finished waist for size 10 is 33 1/2" and the finished hip is 40 1/2". While I would normally cut a 12 at the waist and 14 at the hip, I decided to cut a 10 at the waist and a 12 at the hip, as the built in ease seemed like a lot. The finished top fits well. The only place I could possibly use more room is...the bust? I really don't see how that's possible, but the pleats are kind of pulling open above the bust. Weird. Maybe I will cut the center front in a size 12 when I make this again. I made French seams. The side fronts of this thing got pretty beat up because, as I always do when I make French seams, I sewed the first pass right side to right side. Right side to right side is a very ingrained habit. As usual, I did the first pass with the serger so I carefully trimmed off the serger seam and then sewed it together wrong side to wrong side, which is the correct procedure for French seams. And then knifed into the side front. So then I had to trim it off *again*, recut, and resew. Goodness. Luckily, third time was the charm! 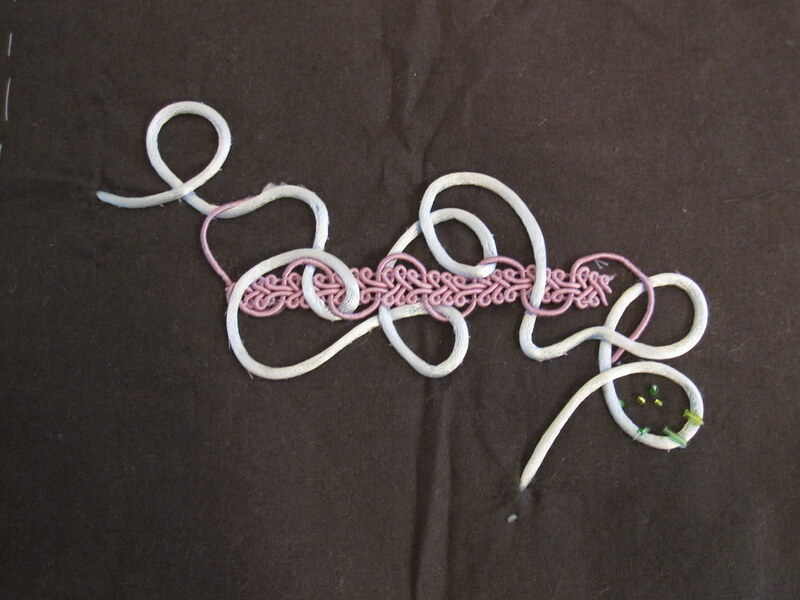 The instructions call for a facing for the neck and bias tape for the armscye. You all know how I feel about a facing: yuck. Since I was cutting bias tape anyway, I decided I'd bias bind the neckline as well. And then I thought it would look nice with the binding as a design feature rather than just a finish. To apply, I trimmed away most of the seam allowances and then bound the edges. I used the binding as I've been doing lately: first, sew to the wrong side, then fold over and topstitch on the right side. It ensures that the right side is perfect. Because my fabric was a little slippery and hard to work with, I ended up cutting and making really wide double fold bias tape. 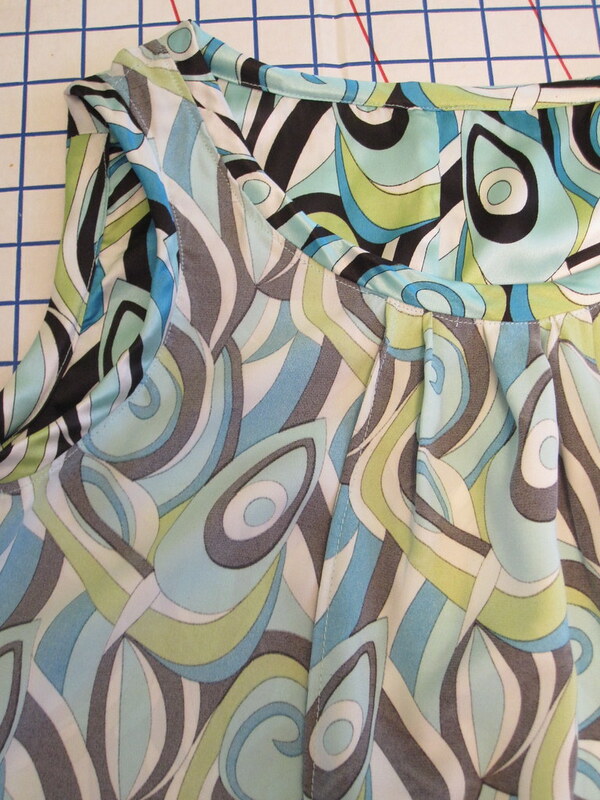 I'm not sure if RTW is showing binding right now, and if so, what width it is, but I'm ok with the wide binding. The love for this pattern is well justified. I am a bit wary of pullover woven tops as they can be really sacky, but this top has a nice shape (although I prefer it belted or tucked). It is summery and cool but works in my office as a nice tailored piece. I am definitely on the lookout for other fabrics to make this in, preferably with a little stretch as with this one. All photos are here and the pattern review is here. Voting is open in the Vintage Contest! I entered my Simplicity 2827 vintage 1950s dress. There are some really great entries so be sure to check it out!